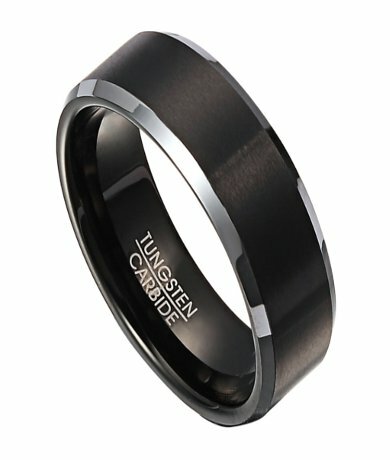 Made from tungsten carbide, one of the hardest materials on Earth, Mens-Wedding-Rings' collection of tungsten rings are extremely scratch-resistant and easily maintain their “just bought” appearance. Offering a pleasantly weighty feel, these rings are equally handsome in tungsten's naturally gunmetal grey color, black tungsten, gold-plated tungsten or white tungsten, which resembles white gold or platinum. Comfort-fit rings should be ordered 1/2 size smaller! My fiance loved the ring. I ordered the wrong size and had to exchange. It was so nice to just send it back and get the new one within days, no run around. I'm very happy with the product and service. I would not hesitate to order from here again and will definitely refer others looking for rings. All I have to say is WOW!!!! This was probably the BEST purchase I have ever bought online. My fiancé decided on this ring which is very masculine for our upcoming wedding in April. I purchased the ring, received a confirmation and had my purchase in my mailbox 4 days later. I know quick right! When my fiancé got home and tried it on, it didn't fit so I ended up having to send it back for a bigger size. We got him sized at a jewelry store and depending on the type of ring, we had different sizes so we kind of guessed when ordering on here. I found the exchange info and sent the ring back with the new size and again received it back super quick with no questions asked! This ring does not look cheap in ANY way so don't let the price scare you away. I would definitely buy from you guys again and I HIGHLY recommend you EVERYONE!!! !